Area: 2181 sq km. 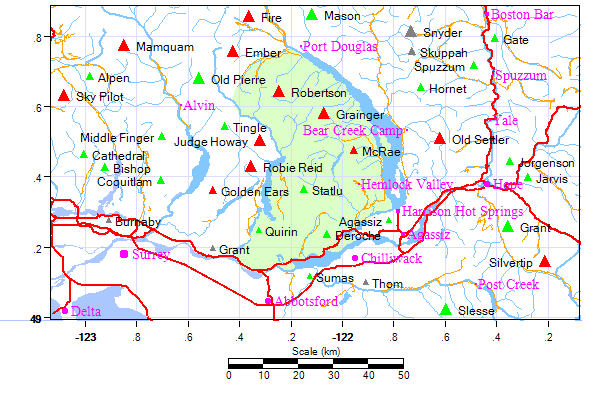 Location: The Chehalis is located north of the Fraser Valley, between the Stave Lake/Stave River drainage and Harrison Lake. The northern boundary is Sloquet Creek. Terrain: Generally speaking this area is a series of east-west trending mountain ridges enclosing creeks which drain either west to Stave Lake, or east to Chehalis Lake. Rock is excellent granite and there are large north faces on most of the peaks. The northern portion of the area, around Robertson Peak, is aligned more north-south, and has more high, meadowed/subalpine terrain. There are essentially no glaciers except for Slesse-style pocket seracs below some of the north faces. These are pretty active in the summer and can create a serious icefall hazard during warm days. History: The major peaks in this area were climbed in the 1940's and 1950's as concerted multiday bushwack/climbing expeditions, generally approaching via Stave Lake and Winslow Creek. Some incredible climbing for the time was accomplished like the North Ridge of Ratney, and NW Ridge of Clarke. Also during this time, logger Cliff Clarke, with his wife and teenage daughters, made a 5 day traverse from Stave Lake to Harrison Lake "just for fun and to see the country" - incredible bushwacking and an attitude that even today is rare. Mt. Clarke is named for this family. After the Culbert guide was published, in 1974, interest in climbing technical routes in the area grew along with knowledge of the potential. Also, Canfor, the forestry tenure holder, opened up their road system to allow for weekend and evening access - previously they had scrupulously kept out the public. The result was a huge burst of new routes being put up in the 1970's and 1980's. This can be seen in three or four separate subgroupings - firstly Don Serl and various partners climbing everything in sight. Secondly, Doug Kasian, a solitary climber in the model of John Clarke, picking off most of the remaining unclimbed summits via nontechnical lines. Thirdly, Squamish climbers other than Serl, most prominently Scott Flavelle, John Howe, Perry Beckham and Peder Ourom, concentrating mainly (but not solely) on the Viennese-Clarke north faces and developing long sustained rock climbs of exceptional character. Bruce Fairley could be in this grouping, or with Serl; he was more or less after the same routes as Serl, but less prolific. The pace of exploration died down some in the 1990s and activity has also decreased largely due to the deliberate deterioration in the quality of the main access road. As a beneficial side effect, though, if you do make it in there today, you will likely have your chosen route to yourself. The historic term for this area is the Douglas Ranges, as can be observed on NGS topos for the mountain country between Harrison Lake the Stave Lake-Hatzic Prairie area. The northward boundary is indeterminate, but for practical purposes would be Sloquet Creek, perhaps including Fire Mountain (immediately northwest from Port Douglas). The ranges are not so much named for Governor Douglas, but for Port Douglas which <i>was</i> named after him. The logic of the naming is that travellers en route to the goldfields in colonial times along Harrison Lake named the mountains on one side of the lake the Douglas Ranges, those on the other side the Lillooet Ranges, in respect to the mame of the road which began at the head of the lake, one name for which was the Douglas-Lillooet Trail.